With the success of the fried eggplant and the new found techniques to the perfect fry anytime, we decided to try some fried chicken. When frying chicken at home, I love to fry with coconut oil. I must say that this fried chicken was not oily at all. It tasted as if I had baked it and not fried it. 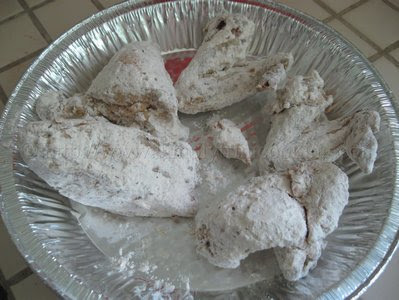 The fried chicken was dry to the touch and even while eating it there was not an excess of oil within the chicken. But some care must be taken when using coconut oil for frying. As I mentioned before about the smoke point of coconut oil being 350 degrees Fahrenheit, it is best to fry in coconut oil over low to medium flame because from experience coconut oil gets hot very quickly. 1. 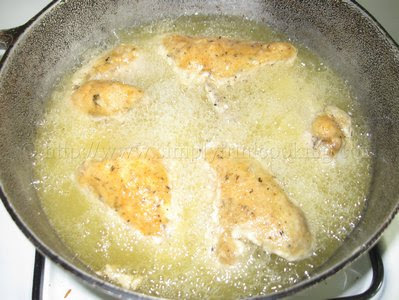 For quicker frying I like to parboil the chicken at first in a little bit of seasoned water. 2. The resting period before frying could be even more than 10 minutes. 3. Add the salt after frying, and not before because salt lowers the smoke point of oil. Thus shortening its life. 4. 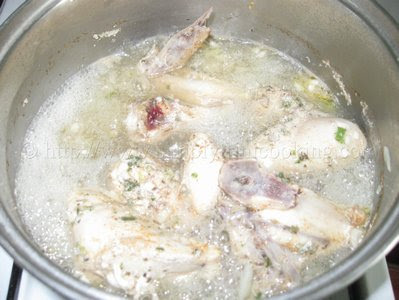 If you fry in coconut oil without parboiling the chicken you will most likely have to bake it to make sure it is cooked properly. 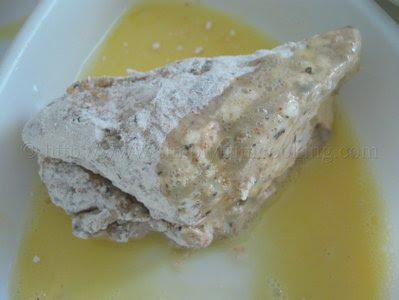 Hope you enjoy this fried chicken recipe. 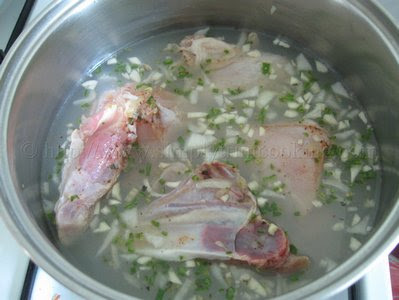 the chopped onion, garlic, a little salt to taste and chadon beni. 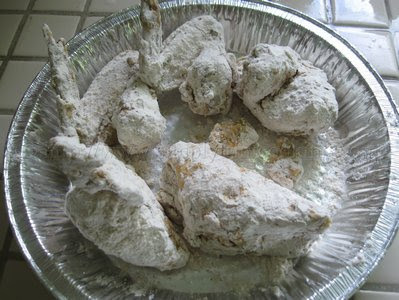 Then dip each piece in the egg wash.
Dip in the flour again and set aside for 10 minutes. Fry over a low to medium flame until golden brown on both sides. Drain on paper towels for about 3 minutes then move to a serving dish. Sprinkle a little salt before serving. Note: Do not let the oil reach it’s smoke point. If the oil is smoking remove it from the flame and or lower the fire. 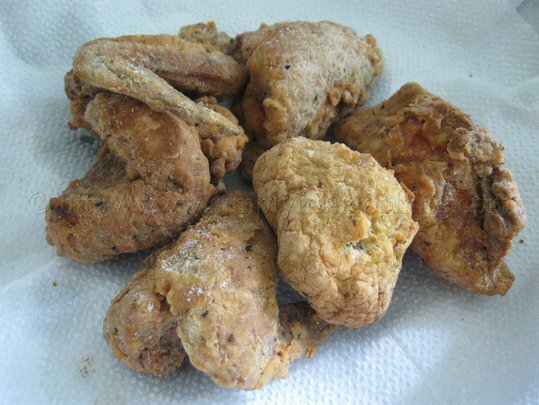 Did you like this fried chicken recipe? I enjoyed my fried chicken with a nice salad with no guilt trips….. I even went for seconds. 🙂 Anyhow, more recipes to come. Ah gone! They look much better than KFC! coconut oil?…you want people to get cholesterol? Yes I found this site Saturday and already I have tried your Fried chicken, bar-b-que sauce, garlic sauce and Trinidad sponge cake with great great sucess. Where have you been all my life, thank you for your love and patience in developing this site. The step by step pictures has really help me by giving me the confidence to create these dishes. Thank you again. Ah love this site….it’s gud and the trini style is authentic!! THANK YOU!!! Is it okay to reuse the coconut oil for a 2nd and 3rd frying? That’s provided that it is filtered and clean and you’re frying only chicken each time. At least that’s what I would do. If I dnt have egg can I skip or is there a sub I can’t find at home? Use milk or buttermilk instead.